One of the world’s major biodiversity hot spots, the Western Ghats of India are becoming increasingly dry. A number of studies in the past five-six years have shown that rain deficient years are becoming more frequent in the 1,500 km hills that stretch across six states on the western coast of the country. India Meteorological Department (IMD) data shows that all 51 districts comprising the Western Ghats received around 21 per cent deficit rainfall between June 1 and September 10 this year (see ‘Steady decline’ on p16). The rain gauge in M N Devaiah’s 8 hectares of agricultural field in Kodagu district of Karnataka—a state that has 60 per cent of the Ghats—recorded only 101.6 cm of rain between January 1 and September 10 this year. The figure last year was 203.2 cm. Farmers in the neighbouring districts of Hassan, Uttar Kannada and Udupi also reported nearly 40 per cent less rain till September 10 this year. The deficit has resulted in drought-like conditions in the districts. “Farmers, whose crops were entirely rain-fed, suffered the most,” says HP Mohan, a farmer from Hassan, whose income from his coffee plantation this year was 50 per cent less than usual (see ‘Coffee concerns’). Coffee requires 152.4-203.2 cm rain per year, at least 2.5 cm of which is required in February. But this year, there was no rain in February, says Devaiah, a farmer in Kodagu district of Karnataka. "The first showers were on May 15," he says. The average figures for southwest monsoon and the pre-monsoon rainfall were 93.9 cm (34 per cent below normal) and 13.6 cm (29 per cent below normal) respectively in Kodagu, Hassan and Chikmagalur—the major coffee producing districts of Karnataka. The rain deficit this year is not unprecedented. According to IMD data, 2012 was much worse, with 33.5 per cent deficit rain in the Ghats. Apart from the decreasing rain, what is even more remarkable is the change in the monsoon patterns of the region. The southwest monsoon (June to September), which accounts for 80 per cent of the annual rainfall in the Ghats, has decreased and the northeast monsoon (October to December) has shot up in the past two decades, says a 2016 paper by T I Eldho and C G Madhusoodhanan from IIT-Bombay. The December 2015 floods in Chennai are evidence of an intensifying northeast monsoon in the region, says Madhusoodhanan. Another 2015 paper by the two scholars says that the three zones of the Ghats—Malabar, Canara and Konkan—show “extreme drought proneness” and that there has been a “significant increase in the occurrence of drought conditions in the last three decades in the Western Ghats”. In coastal Karnataka, 13 of the 33 years between 1980 and 2012 were rain deficient, while Kerala had 24 rain-deficient years in the same period, says the paper. The decrease in rain has had another major impact. This yewwwar, the average groundwater level in the 11 Western Ghat districts of Karnataka was 11.69 m, the lowest in 10 years. In 2015, water levels in seven of the 13 major reservoirs of the state were at their lowest in 10 years. This year, another five were added to the list. The reasons behind the steady decline in rainfall and shift in monsoon pattern are debatable, but researchers say that changes in land use have exacerbated their impact. “Loss of tree cover, reduction in area under paddy cultivation and unregulated activities along river banks have reduced water yields,” says C G Kushalappa, a professor at Forestry College, Ponnampet, Karnataka. The changing monsoon patterns, frequent extreme weather events and rising temperatures are also taking a toll on the biodiversity of the mountain range that harbours over 5,000 species of flowering plants, 139 of mammals, 508 of birds and 179 species of amphibians. In 2009, the Indian Institute of Science (IISc), Bengaluru, in collaboration with Earthwatch, an international environmental charity, and the Hong Kong and Shanghai Banking Corporation, undertook a project to monitor the forests in the Ghats. In Karnataka’s Uttar Kannada district, they monitored 12 one-hectare plots for almost three years. Similar studies were conducted in Shimoga district of Karnataka and Nilgiri district of Tamil Nadu. “We noticed a lot of changes in the forest ecosystem. Intensive human disturbances, apart from natural calamities, had led to erosion of species richness, disruption of the closed canopy and spread of invasive species in a few plots,” says Indu Murthy, professor at IISc, under whom the study was conducted. For instance, in Uttar Kannada, farmers say that Terminalia tomentosa (asana), a vertically fissured greyblack tree whose timber was a good source of income, has disappeared. IISc scientists also observed that canopies had opened up in some of the plots in Sirsi taluk of the district. Although anthropogenic deforestation may be at play, Murthy says there is a possibility that heavy natural winds during the southwestern monsoon caused the felling of trees. Opening up of the canopy causes a proliferation of species that thrive in light. In some cases, these may compete with, and even tually take over, native species. 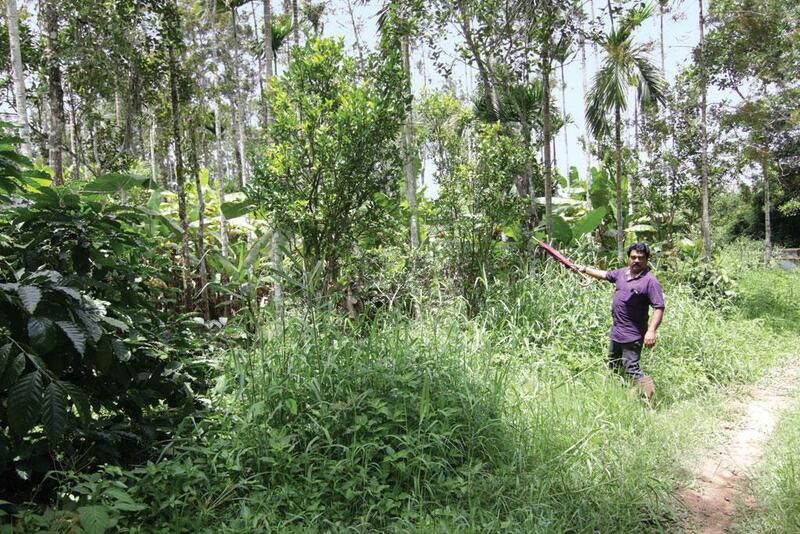 For instance, in Sirsi, researchers observed spread of the invasive Eupatorium chromolaena (Madras poo) in some plots. In the Nilgiri Biosphere Reserve located in the Ghats, a project similar to the Uttar Kannada project, carried out under R Sukumar, professor at the Centre for Ecological Sciences, IISc, shows that the 2001 drought and the 2002 deficit rain made the grasses in the region dry and fire-prone. Their regenerative capacity also declined. As a result, invasive Lantana camara (unni chedi) spread. However minute, such changes in biodiversity are significant. “This is a cause for concern. What we can do is reduce the fragmentation of forests. Greater connectivity will ensure seamless seed dispersal and germination, and may even save species,” says R K Chaturvedi, a researcher at IISc. 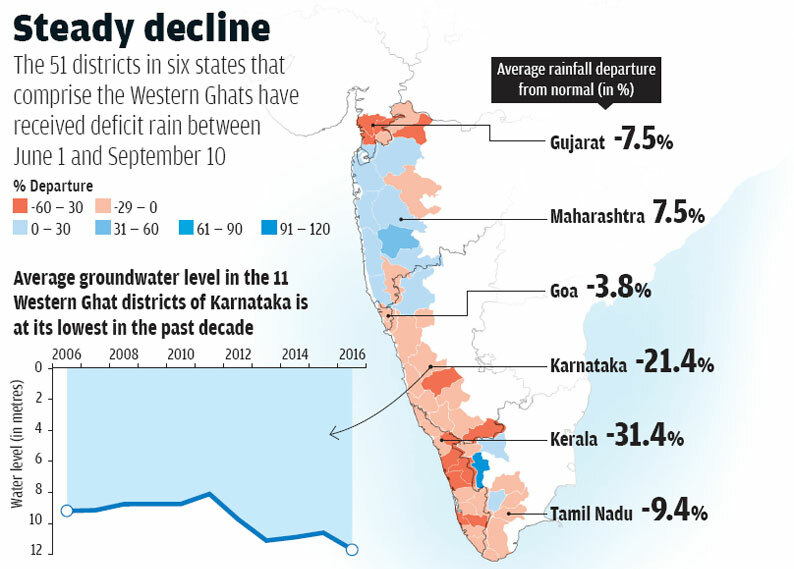 According to a 2012 paper published in Theoretical and Applied Climatology, the trend of declining rainfall in the Ghats will continue, with major impacts on the west coast of Kerala and Karnataka. With climate models projecting a drier future for the Ghats, these impacts are only going to become more pronounced and widespread. “The trend of reduced yield in dams and dry season in rivers will have much wider implications on food security, human-wildlife conflicts and conflicts over water in the entire peninsula,” says Madhusoodhanan. The Western Ghats region is slowly becoming the perfect example of climate change in action, he adds. This article answers my doubts on temperature rise! Southern Kerala has never suffered such scarcity of water! Our wells are dry and the heat is unbearable, monsoons of october have skipped this year. Make a move towards saving biodiversity id a must! DON'T CUT TREES! PLEASE PLANT MORE!